A new year, and that means a new issue of Midwestern Gothic. 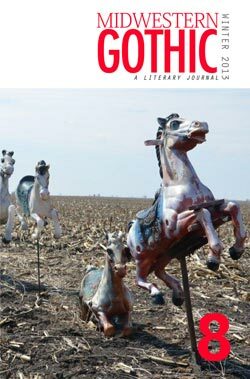 Issue 8 (Winter 2013) of Midwestern Gothic might just have my favorite cover so far – the image of the Cornfield Horses from David J. Thomspon is one of those unique shots that we just couldn’t ignore. It’s a little bit whimsical, and a lot weird, but that’s what makes us love it – just like we love the Midwest. Once you get past that and into the guts of the issue, there’s still plenty of whimsy, weird and stuff you won’t find anywhere else but the Midwest. The next day Helen purchased a mini tape recorder and a package of mini tapes and stopped by Gertrude’s house. “Tell me about Europe,” Helen said, and she turned on the tape recorder. “What do you want to know?” Gertrude said. Gertrude eyed the tape recorder questioningly. “I just want to remember,” Helen said. After she left Gertrude’s with two full tapes, Helen stopped by to see Miriam, who had lived in France, and then dropped in on Jeanette, who had spent some time in Italy. phrases and retold favorite anecdotes, replacing husbands with friends.